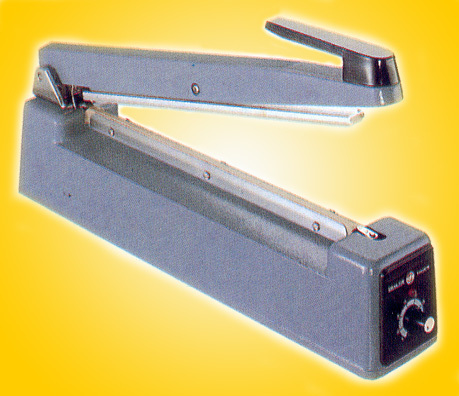 Pick Out Your Hand Sealer! Sealing Lengths from 4" to 40", Seal Widths from 1/8" to 1/2" Flat, or Round Wire, ATW has your hand sealer with and without cutters...IN STOCK, same day shipping! 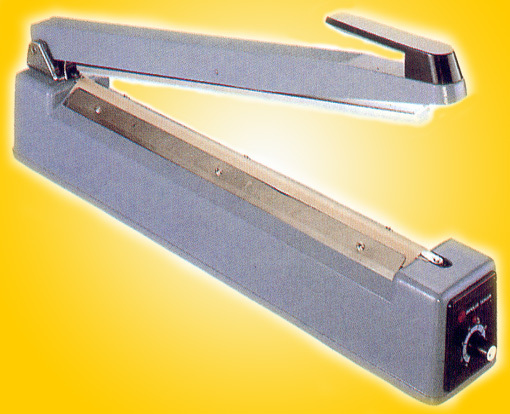 Scroll down to check out the new Semi-Automatic Hand Sealers Magnetic Arm Hold Down. TEW / AIE Sealers! 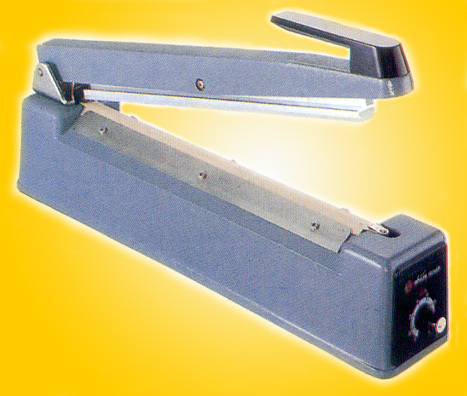 The Original Impulse Heat Bag Sealer, and Still #1 in Worldwide Sealer Sales! Often imitated but never duplicated! 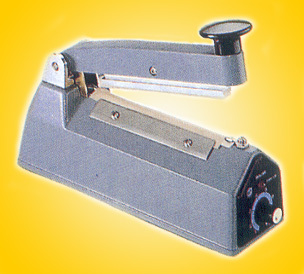 TEW / AIE quality UL Approved impulse sealers, manufactured in Taiwan. Safest to use! The Best Built! Highest Quality! Easiest to Maintain! The Most Powerful and Longest Lasting Sealers You Can Buy! The Leader in Industrial Quality and Performance For over 40 Years! AIE-100 4" AIE-200 8" AIE-300 12"
AIE-400 16" AIE-500 20" AIE-600 24"
Try out a 12" Sealer with optional magnetic arm hold down feature. The arm holds itself down in place, while you slide the safety blade across the arm to cut the tubing. Really nice! 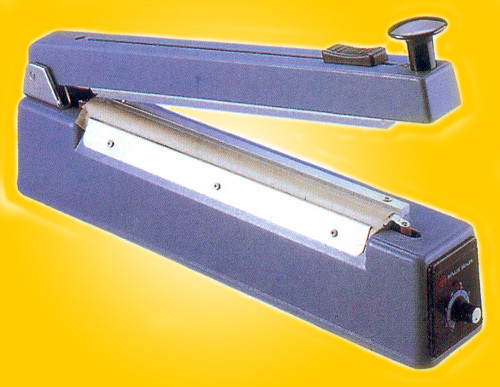 Magnetic Hold is available in 12" regular and cutter sealers. Seal and trim poly tubing in one step, or simply slide the knife to trim bag tops 1/4" above the seal. Press the handle to seal then just slide the cutter across the tubing to make the perfect bag size! So Easy to Use! 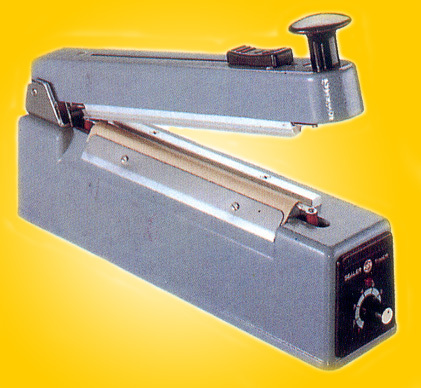 Sometimes these are called Tubing Sealers or Bag Trimmers, but you'll call them terrific!! PLUS, you find several choices of seal widths from 1/8" up to 1/2" (depending upon the model). If you've got tubing or bags to seal, we've got your sealer! Just insert the tubing or poly bag, push the sealing arm down to make perfect seal, then while the arm is down, slide the blade across the arm. Cuts the top of the bag or tubing cleanly, 1/4" above the seal. If you'd like to see what a trimmed bag seal looks like. 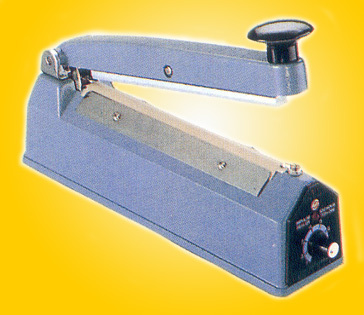 just call us (800 759-3388, fax 541 484-1493) or send us a few of your bags or tubing pieces and we'll seal it, trim it and send it to you at our expense! Click to Get Prices for Spare Repair Kits & Heating Element Wire Kits Free Shipping on all kits when you buy three! ATWH-400 16" AIE-405 16" AIE-500 20" AIE-600 24"
Special Features 1/4" Wide Fisnished Seal 1/4" Wide Fisnished Seal Semi Auto With Seal Arm Hold Down Magnet 1/4" Wide Finished Seal 20" Seal Length! 24" Seal Length! 14 lbs 16 lbs 13 lbs. 8" 8" 8" 12" 12" 12" 16"
& AIE Factory Authorized Service. We Stock Parts For Nearly Any Brand of Sealer! Free Shipping for Repair Kits, Spare Heating Element Wires, PTFE Tapes and Cloth/Fabric kits when you buy three, as well as a HUGE inventory of poly bags and tubing, cellophane bags and shrink wrap, shrink bands and shrink tubing. Free Shipping on spare impulse sealer repair kits and heating element wires when you buy three kits!